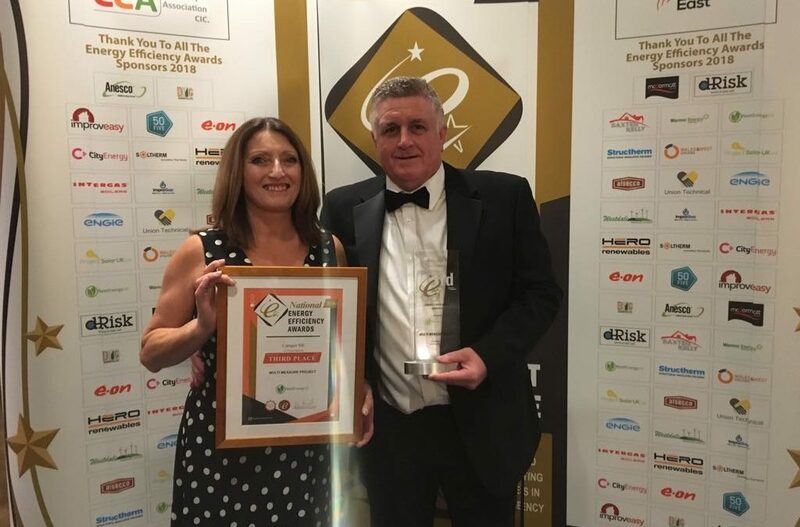 Electek Solutions (ESL) have claimed an impressive bronze in this years National Efficiency Awards in September, no mean feat when you’re up against international energy players such as E.on Energy. ESL were awarded the accolade for the Multi-measure Project of the Year Award recognising the project which has most successfully melded the various energy efficiency technologies available into a solution that will help reduce energy consumption, and help save money. This was the marquee category of the awards evening. David Hutchinson, Managing Director of the ESL, said: “To be recognised at this level, on this national stage in truly warming for ESL. The pride from this is for the business and the team that work to deliver outstanding projects to our customer base. The entered project for the awards was for Camper NE. A project to significantly reduce the energy consumption and carbon footprint for an energy efficient building while considering innovative building technologies compared to traditional installation.